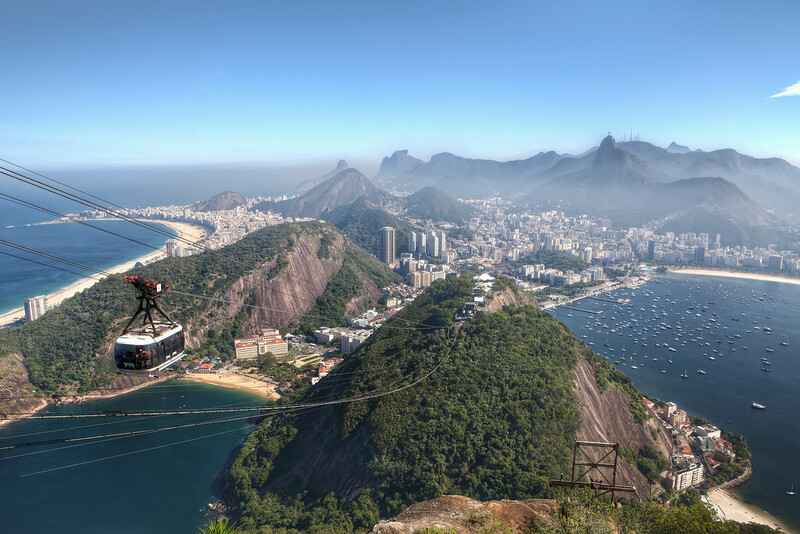 Rio de Janeiro is set in an amazing setting as the city seems to drape itself over the mountains that grow out of the ocean. 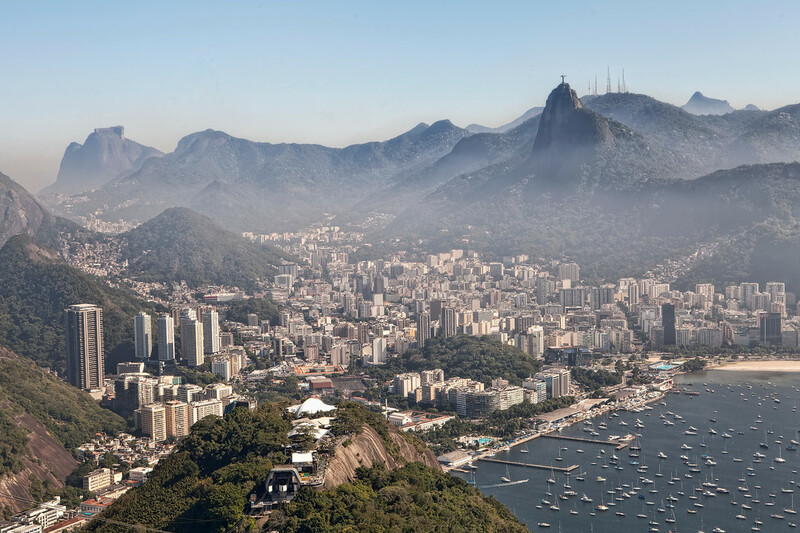 I was only there for a few days during the World Cup so didn’t really get a feel for the city, apart from a couple of interesting nights out in the Samba district. My dad and I also stumbled upon a restaurant for lunch one day in Ipanema that was so good we had to bring the rest of our group back there for dinner the same day. We worked up our appetite that day by first visiting Sugar Loaf mountain where we got this view back over the Botafogo district, where we were staying. 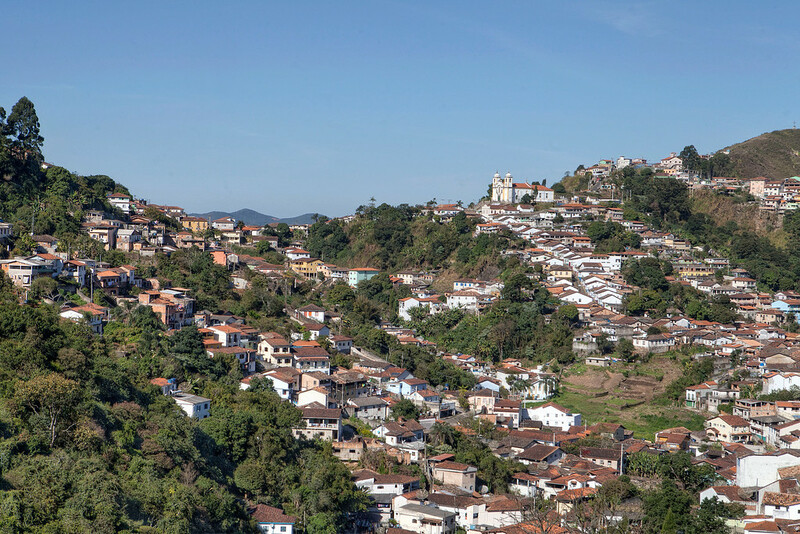 While in Brazil for the World Cup we took some time out for a side trip to Ouro Preto in Brazil. It’s an old gold mining town perched atop steep hills. There’s a church with an amazing gilded interior, but you couldn’t take pictures inside. The church in this picture isn’t that same church, but gives you a good idea of what the town looks like. I didn’t manage to take a lot of pictures while I was in Brazil as there was a pretty sizable distraction on the go… the World Cup. My Dad and I did make the trip up Sugarloaf Mountain though and I managed to take the following picture, which I’m very happy with. I’ll probably be getting it printed. If you look closely at Copacabana beach, the furthest left, you can see the FIFA Fanzone set up on the sand. Admittedly, you’d probably have to know what you’re looking for to find it. This is another of my old pics shot with a tiny point and shoot. I’d love to go back here again. We were on our way to the Ayuni salt flats when steam appeared on the horizon. Before we knew it we were stepping out of our jeeps in front of gurgling, churning, stinky wasteland like nothing I’d ever seen. Then, our jeeps drove on, to pick us up on the other side. 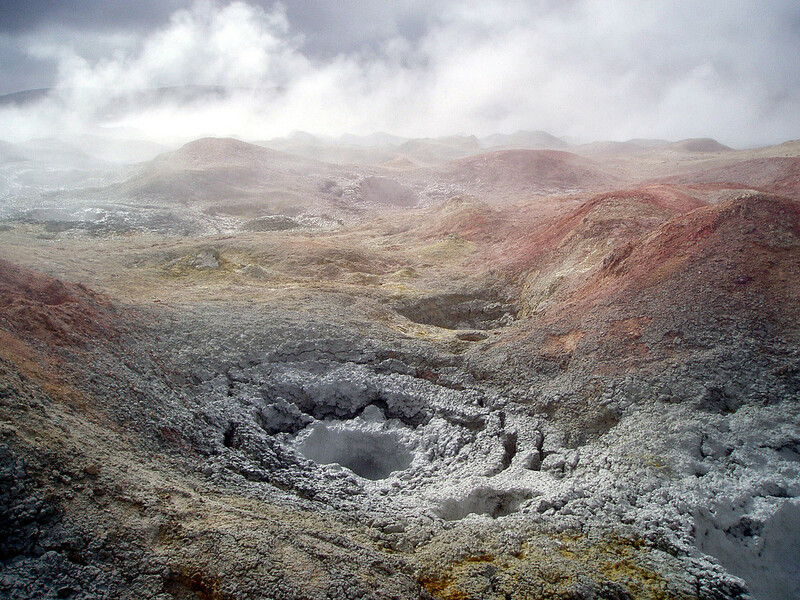 We were actually allowed to walk right through these geysers, not a safety barrier in sight. It was pretty amazing, but you definitively had to watch your step. You may have noticed that I’m scrambling to get backdated posts up. I started running low on new photos and may only have photos of Guatemala left to process. So to keep up the variety I’ve looked back to some of my earlier photos. Today’s picture is from about 10 years ago and was taken on my first adventure where I caught the travel bug and got interested in photography. 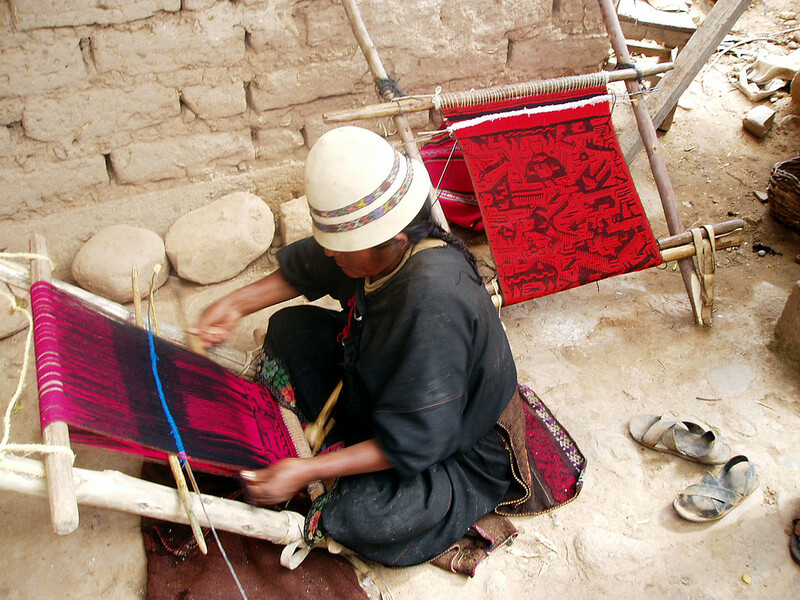 This is a Quechuan weaver at work. We’d travelled from Sucre to a native village that was just beginning to open up for tourism. An American man was our guide. He had been living with the community assisting them in developing revenue streams beyond farming. He was fluent in the Quechuan language. When we arrived at the village they were very excited to have their first group of visitors and put on all sorts of displays for us, including a rather terrifying man dancing around wearing a goat’s face as a mask. The children, in particular, followed us around in a big excited swarm. This photo was taken on a small point and shoot camera made by Olympus. That little thing was rugged and managed to survive 5 treks, ice climbing, walking through the jungle with a puma, sand dune boarding and numerous drunken nights out. Last year I managed to keep the locations of my photos varied pretty well. I was able to switch between images taken from South Africa, Zambia, Rwanda, New York, Canada, Prague, Iceland and Italy. At the moment I’m feeling like all I’ve got are African shots and any Bermuda shots I manage to sneak out and take. So, I’ve decided to share some of my earliest photographs from my first real adventure. I took a gap-year before heading to University, and got to head down to Bolivia and Peru. That’s where I became a bit of a travel addict and discovered I quite liked taking pictures, and wasn’t too bad at it either. I had a little Olympus point and shoot. I can’t remember the model but it was pretty robust. It survived walking a puma through the Bolivian jungle, 4-treks in Bolivia and Peru, and even sand dune boarding (also known as falling over a lot). Driving across the Ayuni Salt Flats is one of the most amazing things I’ve ever done in my life. Miles upon miles of whiteness, minimal landmarks, and no signs of civilization. 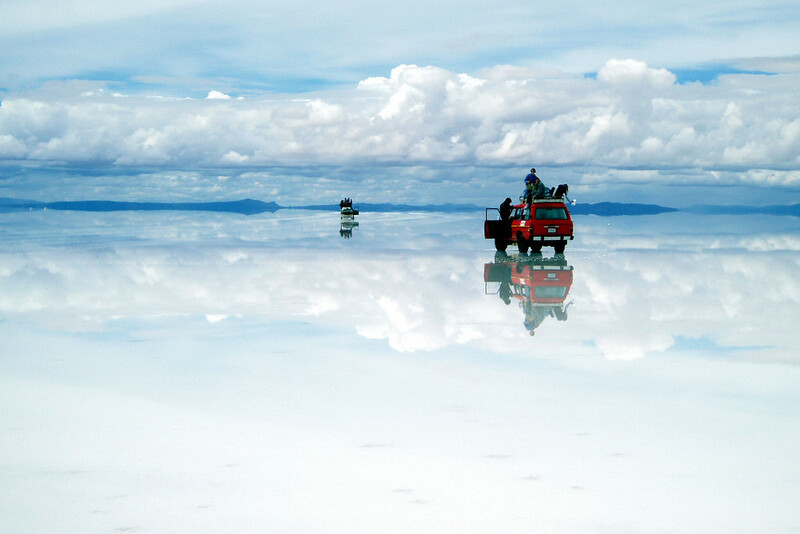 When we were there, a thin film of water over the salt turned the entire place into one giant mirror. It was like driving in the clouds. This shot is taken from on top of our jeep. In the picture, you can see one of the girls making her way on to the roof and in the one ahead, you can see the luggage rack is already loaded with people. It was an exhilarating ride, but the salt water splashing up turned all of our clothes into crusty messes.